Fancy splashing about on the river? Inspire2Adventure provides guided open canoe trips along the picturesque River Wye - the perfect fun activity for family, friends, work colleagues, hen and stag parties. Under supervision of our professional instructors, you'll paddle your way through the Wye Valley. 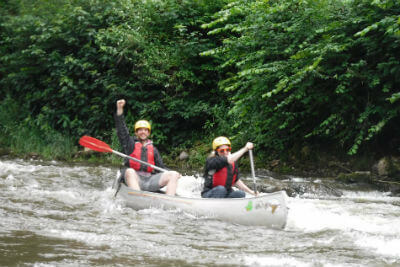 Working in pairs, you'll learn new skills and techniques and by the time you reach Symonds Yat you'll be ready to shoot the rapids and explore a further stretch of the river. Yes, you will! Want to master open canoeing? We also provide personal coaching courses and skills development in open canoeing. Rather than just shooting the rapids, learn the skills required to play the rapids, hit eddies and surf. For availability and more information about open canoeing, please call us on 01600 891515 or send us an email.